Hollywood Air is an airbrush makeup brand created initially for the Japanese market with the supervision of makeup artist Dominie Till (King Kong, The Lord of the Rings trilogy). After its debut in Asia a branch was established in the UK, making the product readily available for the European market as well. 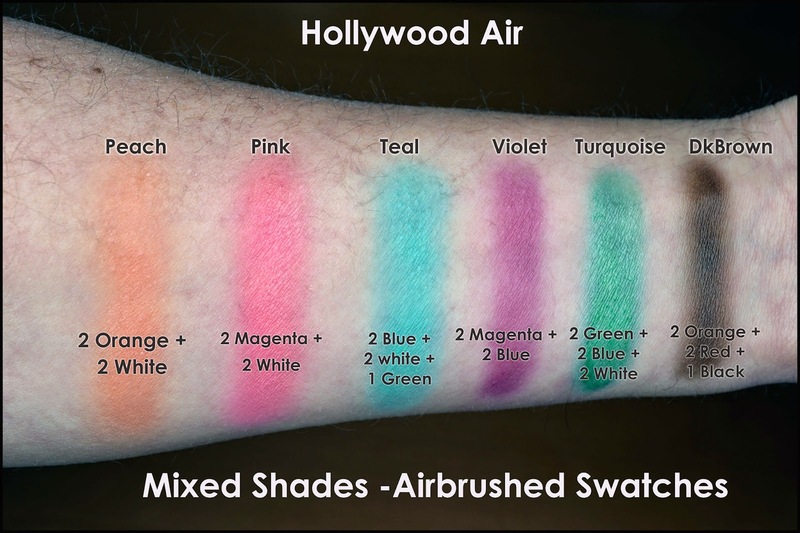 Hollywood Air offers a selection of water based foundations and a series matte primary colors complemented by two shimmer shades and two blush colors, plus a line of makeup complements and skin care products also created for airbrushing. 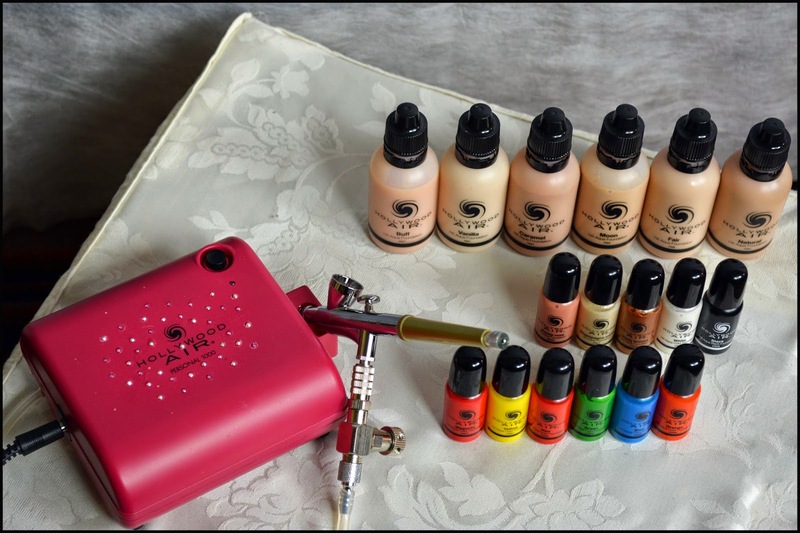 The products are available individually or in kits that also feature proprietary compressors and airbrushes. The kit we purchased was a pro selection created for trade fairs and featuring almost all of the foundation shades in 50 ml sizes, all of the other colors and a silicone based makeup sealer called HA Aqua Proof Top Coat. 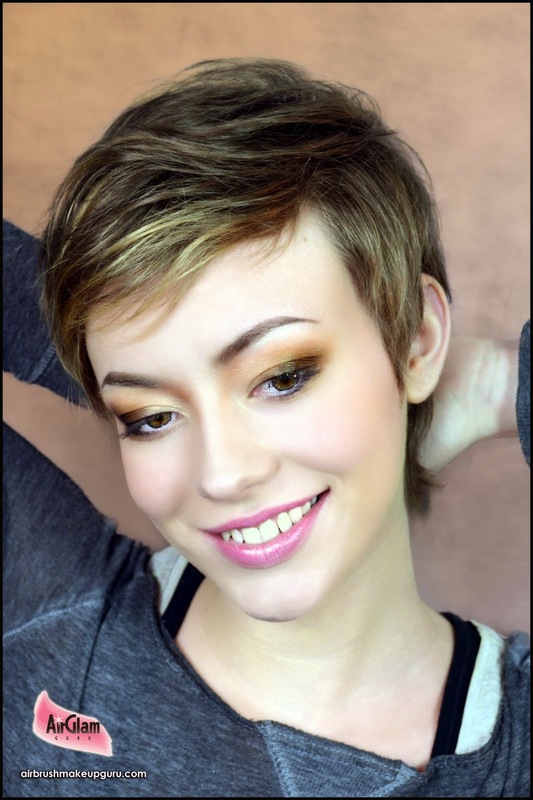 Let's discuss each item in the kit, and please don't forget to scroll to the bottom of this page to view our video tutorial detailing how the makeup in these photos was achieved. The first thing that impressed us was the packaging of the kit. In accordance to our perceived Japanese sense of style, everything in the box was presented very elegantly and organized very neatly. We appreciated the presence of a few extra items such as a pipette/dropper, empty mixing bottles and an all purpose stencil in very soft plastic. The main components are housed in an attractive case that makes the set appealing also for personal use. Let me say this right away: this brand features some of the best proprietary airbrushes we have seen. While in the photos they may look like the standard third party airbrushes used by many consumer oriented companies, you realize as soon as you pick them up that they are of a far superior quality. Then you start using them and makeup just flows -and cleans- like a dream. I have no way of knowing who the original manufacturer is but they are definitely at a par with our beloved Sparmax airbrushes, which as you know are used by all the top brands worldwide. The airbrush features a trigger regulator on its tail end (a little knob that can be adjusted to limit the trigger movement and control the output), and a quick release connector that attaches it to the adjustable pressure valve connected to the compressor. A simpler version of the airbrush with a standard tail end is also available but its main body is of the same high quality. The compressor included in the kit is called "Personal 1000". Our version is the "Crystal Edition", and features hand applied crystals for decorative purposes. It only has one pressure setting but this does not matter as the pressure can be adjusted through the airbrush valve. It performs well and is not too loud. A version with three pre-set selectable pressure outputs called Perfect Beauty is also available, and there is also an ultra portable smaller one, the HA Mini, again with one pressure setting. The quality of the foundation is very impressive, and once again comparable to the best brands available. The water based formula is smooth and does not feel too dry or powdery. It has an excellent staying power and good water resistance, and can be layered to achieve the desired coverage without looking obvious on the skin. The only down side of it is the number of shades available, which may limit its usage to Caucasian and Asian skin tones. While it is true that the darkest shade can be darkened further by adding a few drops from the primary colors set, this is not a terribly efficient solution both for color consistency and for sheer practicality. The seven shades available are divided in yellow based tones (Vanilla, Moon, Natural and Caramel) and neutral/pink based tones (Fair, Buff, and Earth). 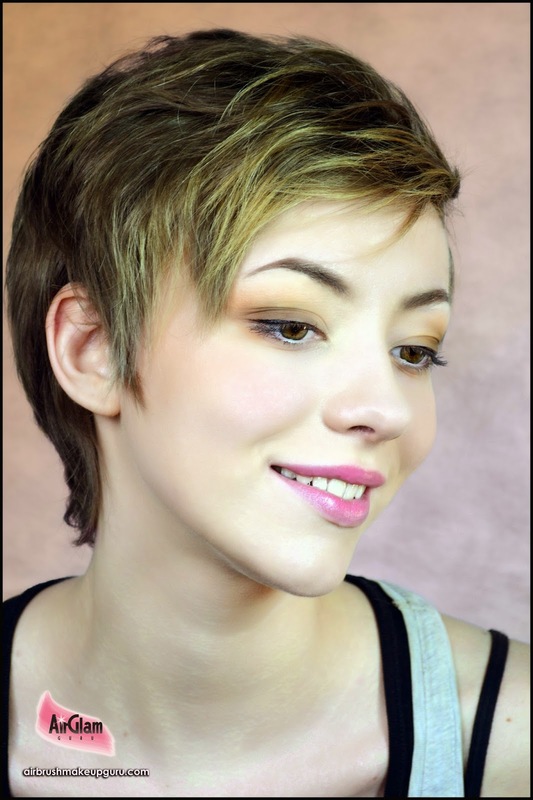 The shades can be mixed to match any light to medium skin tone. The primary/secondary color set is a series of 1.4 oz / 7.5 ml pigments that will allow you to create pretty much any other color both for eyes, cheeks and fantasy application. Adding a series of basic colors instead of creating a whole line of eyeshadows and blushes is a policy followed by other professional companies such as MAC and Kett. Some may find the idea of creating your own shades daunting. I think that it can be a wonderful introduction to color theory for a budding makeup artist, and a great source of fun for a personal user with a creative mind. I had a great time putting together the swatches in the photo, that are all obtained by mixing two or more of the shades in the kit. Please click on the photo to view the colors and quantities used. There is a very interesting series of skin care products that we hope to review in the future. The one complement that we did get is the Aqua Proof Top Coat. This is a silicone solution of very light consistency that can be sprayed over the makeup to render it waterproof. We have tested it and can confirm that it works very well indeed, and could work on any type or brand of makeup too. We advise to hold your breath while spraying it because it creates a very fine mist that will go everywhere. When done with the application you may want to dust a little HD powder to take care of any residual tackiness. Hollywood Air sells directly from its website but can also be found at many beauty trade shows and through secondary ebay distributors. The kit combinations available for purchase tend to vary significantly, so it is always worth checking all the possibilities repeatedly in time to ensure the most convenient deal. Ho appena terminato di vedere il video su Youtube riguardante questo tutorial.. CHE DIRE MERAVIGLIOSO è POCO... Grande professionalità come sempre....! I really love this tutorial, thank you for share this with us! In fact a review is very helpful to know about the performance and specification of the tool as discussed in this post. The page 3 will let you know about such a review and related information as it is. Have a go! Air conditioning commonly refers to the process of cooling or dehumidifying the air for comfort. Such is the early purpose served by hvac repair mt kisco, to provide coziness especially during hot or warm seasons.